Case Study | Beek — TH Creative Co.
Beek started with the belief that beauty can be comfortable and that great products (and life, for that matter) get better with age. 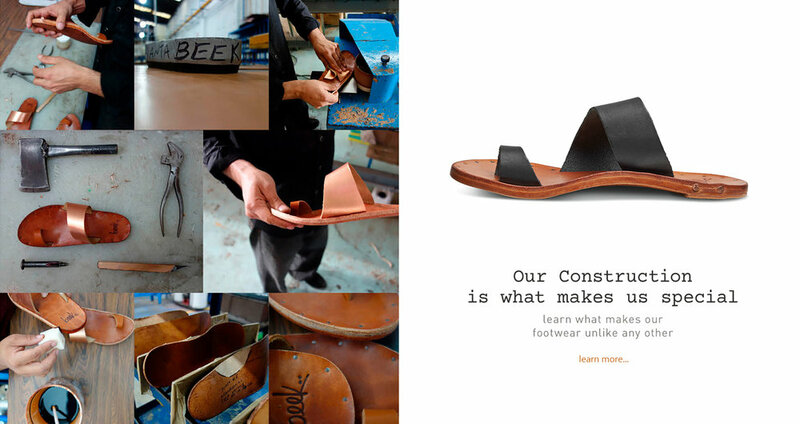 . . so co-founders Birgit Klett and Kenna Florie set out to create a line of handmade leather sandals that could be all that: gorgeous, easy, and timeless. We have been a part of beek since it’s inception. Working with the founders, we formulated and created the brand story, voice, and identity to launch it into market. We have continued to evolve with them by managing creative and marketing efforts (all print, packaging, social media, PR, and digital brand assets). Beek has a cult following of loyal customers and brand fans via social networks and regional events, is carried in some of the most coveted major retailers along with about 70 high-end boutiques across the U.S., and has been featured in Vanity Fair, In-Style, Allure, Town & Country, LA times, NY times. From website design to email campaigns and social media, we manage Beek’s digital footprint from top to bottom. In addition to ensuring strategic alignment across all platforms to tell key seasonal stories, we also focus on building the email database and social audience to drive sales and brand awareness. Conceptualized, created and launched unique product collaboration between Beek and ceramic artists Kat + Roger. Work spanned from initial product design through to full creative package and marketing communications via catalogue, website, social media, PR and retail events, resulting in brand awareness with a cult following within a targeted boutique space.